Smartphones have become a near necessity in life, so why buy a new case every time you get a new phone? The All American, Indestructible Leather Cell Phone Case XL is the perfect multi-purpose companion for large smartphones and will last longer than your cell phone provider's contract. Fits all smart phones including iPhone 5, 6, 6plus, 7, 7 plus, 8, 8 plus, X, Samsung Galaxy S5, S6, S7, S8, S9, and Google Pixel. The Slip-proof black metal oxide belt clip firmly grips your belt or waistband and wont come loose or fall off when you pull out your phone. Our phone case is Proudly Made in the USA from vegetable tanned leather that will not corrode metal objects like other leather can. Our case has ultra durable stitching throughout with double stitched seams on stress points for added strength and durability. 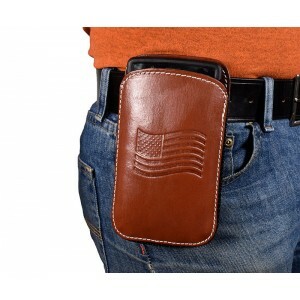 The case is embossed with the American Flag and is a beautiful Mahogany color. Keep communication within reach with Blue Stone Safety's All American, Indestructible Leather Cell Phone Case XL!